I personally believe Syntol for yeast infections is superior to Threelac, Fivelac, Probio5, Candex, YST Management and almost all other specialty probiotic enzyme formulas for yeast except for Biofase and below are the reasons why. I'll take a look at these formulas briefly and their contents. You can also read the pages that are all about each product for further information. First off, lets take a look at the contents of Threelac. Threelac contains 200 Million CFU's of three different strains of bacteria that are said to eat yeast along with fiber, lemon juice powder for flavor, and refined yeast powder that is said to keep the bacteria alive. Thats it, that is all it contains. Fivelac contains the same bacteria as Threelac but in a much higher dose, 1.5 billion; plus they added bifidobacterium longum and acidophilus for a total bacterial count that is a little over 2 billion. It also contains the yeast powder, FOS, fiber, lemon juice powder, silica, canola oil the artificial sweetener erythritol. Probio5 contains 200mgs of the enzymes protease, peptizyme, cellulase and chitosinase that are designed to eat yeast like YST Management or Candex; and 100mgs of the bacteria l. sporogenes, l. acidophilus, l. plantarium, b. longum and s. boulardi. 100mgs of bacteria is about 1 billion colony forming units. It also has a little vitamin C, grapeseed extract and vitamin B6. Candex and YST Management contain an incomplete profile of enzymes so they do not breakdown the biofilm yeast builds over itself as a means of protection. One dose of Syntol for yeast infections contains 13.6 billion cfu's of beneficial bacteria, far more than any of these others. The bacterial species are l. acidophilus, l. lactis, l. plantarium, l. helveticus, b. bifidum, and bacillis subtilus. Many of them produce hydrogen peroxides that kill bad bacteria and fungi. Bacillis subtillis was discovered in 1835 and was named Vibrio subtilis by Christian Gottfried Ehrenberg, and renamed Bacillus subtilis by Ferdinand Cohn in 1872. B subtillis was used in the 1940' and 50's because it was found to stimulate broad spectrum immune activity. It was also use for treating Rotavirus and Shigella. You might run across other websites claiming that B subtillis is used to make antibiotics and therefore kills all your good bacteria, this is partially true. In 1945 John T. Goorley isolated a strain of bacillus subtillis from a girl named Tracy that had a compound fracture in her leg. The b subtillis was helping this girl fight off a staph infection because of its antibiotic ability. In 1948 they created an antibiotic called Bacitracin from this b subtillis strain that they named Tracy 1. Bacitracin is still in use today in the form of an antibiotic cream, because it does not work in the intestine, to treat staph infections. Syntol for yeast infections does not contain the Tracy 1 strain of b subtillis! Further more, all good bacteria, such as acidophilus, have antibiotic properties because they make hydrogen peroxides. It does not hurt the good bacteria that make it; that would be suicide and it makes no sense that they would do this to themselves... does it? Micro-biologist J. Harmann's research showed bacillus subtillis was able to stimulate IgA, IgM and IgG antibodies therefor boosting the function of the immune system. This is important because IgA especially is what defends the mucosal linings of the body from infections like candida. The other two work on long term candida infections that have become systemic. These antibodies also defend the body from bad bacteria and viruses. Bacillus subtillis products are still in use today in Europe and Israel by the medical community. The bacteria in Syntol for yeast infections have been forced into a spore form. Sporulated bacteria, or a bacteria that has been forced into a spore form, have been found to survive the stomach acids intact and make it to the intestines where they need to be. Once in the intestine the spores attach to the intestinal wall and germinate and become living. It is a very effective delivery system designed to get these bacteria to the intestine where they are the most beneficial. Sporulated bacteria also do not have to be refrigerated because technically they are not alive until they germinate in your intestine. This also means they will not spoil and grow molds in your body. 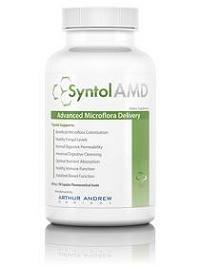 Syntol also contains saccharomyces boulardii, which is a substrain of saccharomyces bakers yeast. Saccharomyces boulardii has been used to treat acute diarrhea caused by IBS, IBD, C. Difficile, Travelers diarrhea, HIV/AIDS related diarrhea, and antibiotic associated diarrhea. One serving, 4 capsules of Syntol for yeast infections also contains about 1240mgs of the yeast eating enzymes cellulase, hemicellulase or chitisonase, protease, amylase, glucoamylase and serrapeptase. Some of these enzymes are found in other products such as Candex, Candizyme and YST Management and in clinical studies have been found to eat the cell wall of yeast, which of course kills it. The enzymes are enteric coated as well so they do get into the intestine. Vitamin C and a little oligosaccharide, a type of FOS that does not feed bad bacteria, are also in the formula. Serrapeptase however is not found in Candex, Candizyme or YST Management and neither one of those enzymes products contain any good bacteria. Serrapeptase is a systemic enzyme that helps reduce swelling, fluid retention and reduces inflammation caused by yeast or other reasons. It also reduces pain and is often used in Europe in place of ibuprofen and other NSAIDS. It also eats the fibrinogen, which is a component of candida yeast biofilms, none of the other yeast eating enzymes on the market do this except for Biofase. More on biofilms here. A lot of companies will enteric coat their bacterial products so that they can survive the stomach acids intact and make it to the intestines alive. They typically use Pthalates, which are essentially plastic chemicals. Arthur Andrew Medical utilizes acid resistant Acid Armor® capsules. These capsules are made of dense vegetable cellulose with a more precise micro-threaded locking mechanism, in order to prevent premature leakage of the capsule's contents. When syntol for yeast infections is taken on an empty stomach with water, you can rest assured the contents do reach the intestines intact. The results of a recent Syntol Clinical Study that was published in Healthy Living Magazine confirms it. Dr. Stefan Bajon conducted the study and he found that Syntol AMD was able to clear candida with very little if any die-off reaction. He claims, Syntol even removed candida yeast from the blood. Read the study, it's short and written in layman's terms so anyone can understand it. Note: The blood analysis test was used using a blood sample on a slide, then placed under a microscope. This is not a valid test, it is to subjective to the person viewing the sample. Yeast in the blood is extremely rare although it is on the rise in patients with life threatening diseases such as cancer. Hyphae producing strains of yeast in the blood usually result in death. Bacillus subtillis is known to cause disease in severely immuno-compromised patients. However, this documented case involved a 73 year old man that had leukemia and chemotherapy so he was severely immune compromised. 1. It has however been given GRAS status by the EPA. 2. I have been using Biofase enzymes for a couple of months now with considerable success. For the past 14 months I have been on a near-paleo and sugar-free diet and taking Syntol and the CP-1, along with various antifungals. This combination of strategies based on your recommended protocols allowed me to live pretty much symptom-free until a period of high stress and a little too much relaxing of my diet led to a return of some candida symptoms last fall. Shortly after starting on the Biofase this winter, I experienced a die-off--the first die-off in a year. 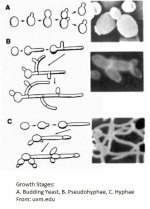 Ever since then, I have observed that the Biofase seemed to return my candida to lower levels more quickly than I would have expected the Syntol to be able to do. I have already recommended Biofase to two friends who have been dealing with candida-related medical problems and I will continue to use it myself on my quest to wipe out the candida once and for all. I really appreciate your quest to find the most effective ways to kill off candida. This one was a success. Keep up the good work. I was always struggling with yeast infections. Lately however, I have reached a point where I was unable to manage through conventional methods (prescription and over the counter anti fungals) and it's sent me on a quest to heal myself naturally. After several months of trial and error and a lot of research, I've found a combination that has boosted my ability to prevent infections and Biofase is a major component of this treatment. I take 3 Syntol, 3 Biofase and 1 Saccaromyes Boulardi in the morning and 3 Syntol and 3 Biofase at night. It took some time to figure out what my dosage needs would be for the Biofase but once I got up to 3 two times a day things clicked. 3. Invasive Saccharomyces infection: a comprehensive review. Clin Infect Dis 41:1559-1568, 2005. 6. Hong, Huynh A.; Khaneja, Reena; Tam, Nguyen M.K. ; Cazzato, Alessia; Tan, Sisareuth; Urdaci, Maria; Brisson, Alain; Gasbarrini, Antonio; Barnes, Ian; Cutting, Simon M. (2009). "Bacillus subtilis isolated from the human gastrointestinal tract". Research in Microbiology 160 (2): 134–43.